Developed by herbalists, our software is designed to aid practitioners through the prescriptions writing process. From Diagnosis, pattern differentiation, modifications and conversion our software makes the entire process easy, accurate and swift. You can choose to work in Raw or Granular format at anytime. By clicking the tabs you can go back and forth between the two modes. 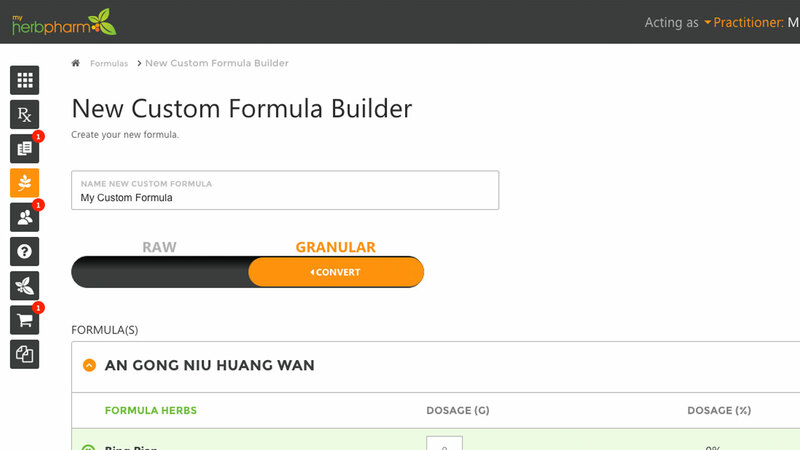 Convert your dosages from Raw to Granular and vice versa with just one click. Once in granular format, our software will also instantaneously change the dosage of single granular herbs while holding the integrity of the original ratios. if you choose to add herbs, remove herbs or change the dosages of the existing ingredients, our program will do the math! Use this function to quickly add a formula to your prescription pad. You can find a formula using formula finder or if you already know a formula by name you can simply pick it and it will populate with its ingredient. You can also look up your favorite formulas, or find a formula that you have personally named in the past. This function helps avoid the hassle of entering formula ingredients item by item. Once you have populated your prescription pad with your formulas, you can add herbs, remove herbs and change dosages. Can’t recall disease patterns and their corresponding formulas? Can’t remember common modifications? 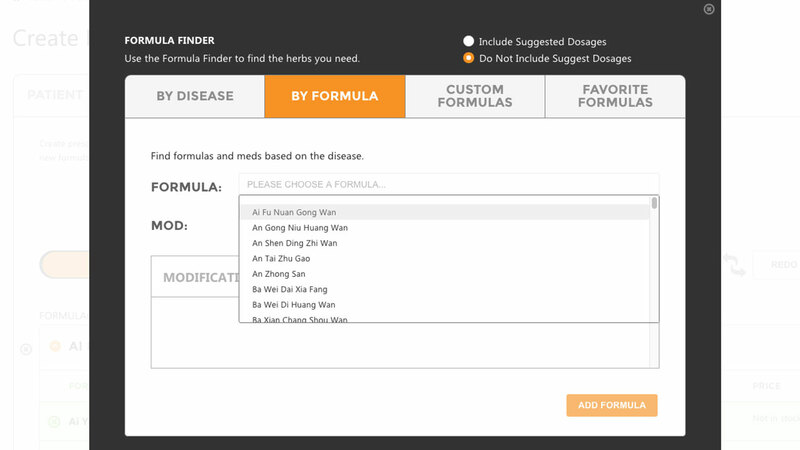 You can use our formula finder by clicking on the “by disease” tab and using the pulldown menus to find diseases, common patterns, associated formulas and common modifications. 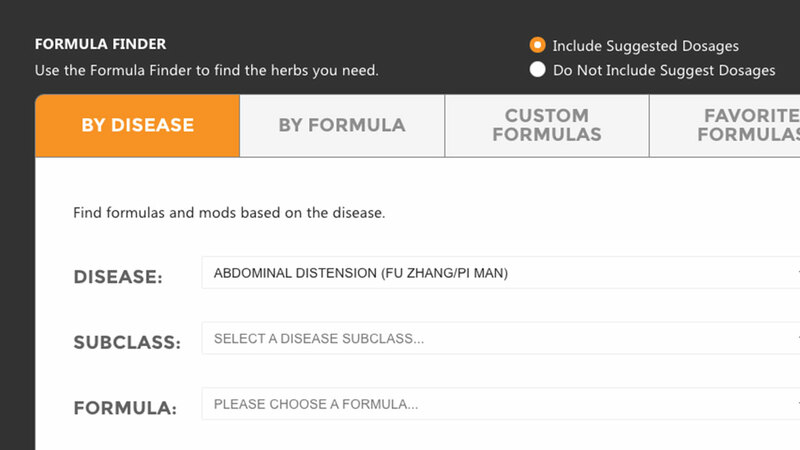 We suggest adding multiple patterns and modifications to your prescription page to easily compare common herbs that are used to treat a disease. 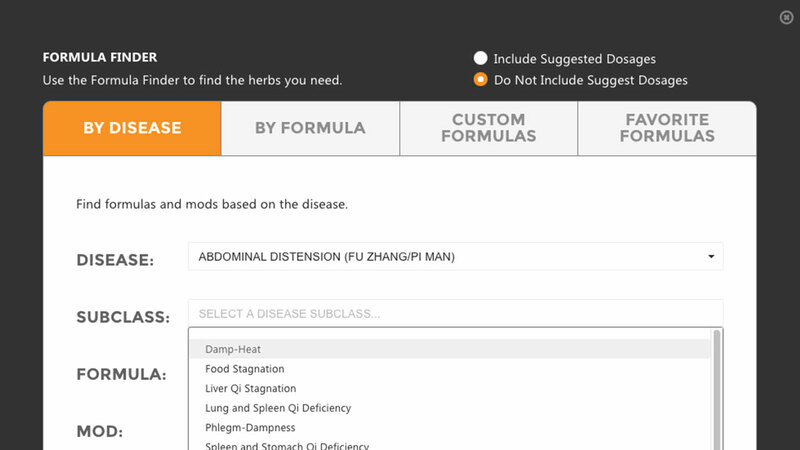 Once you have populated your page with formulas and modifications, you can simply remove the herbs that do not fit your patients patterns and change dosages accordingly. It is nearly impossible to remember every dosage for every herb in every formula. 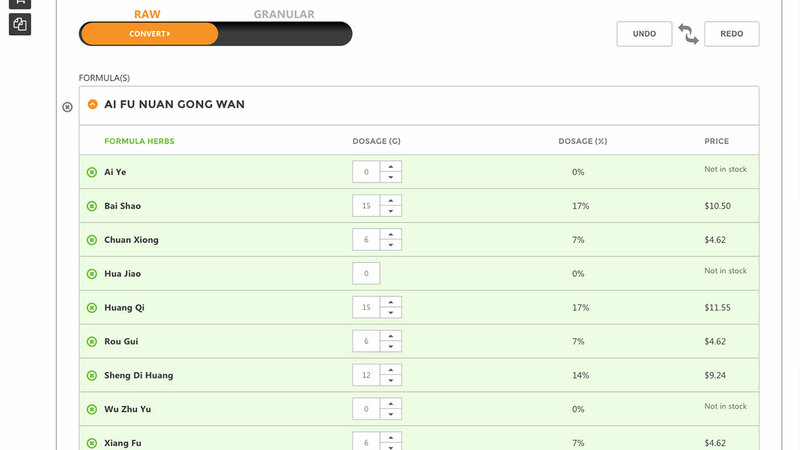 By clicking the suggested dosage radio button, you can see our suggested dosages. Our suggested dosages have been picked to be conservative and to only give you a starting point when customizing your formulas. 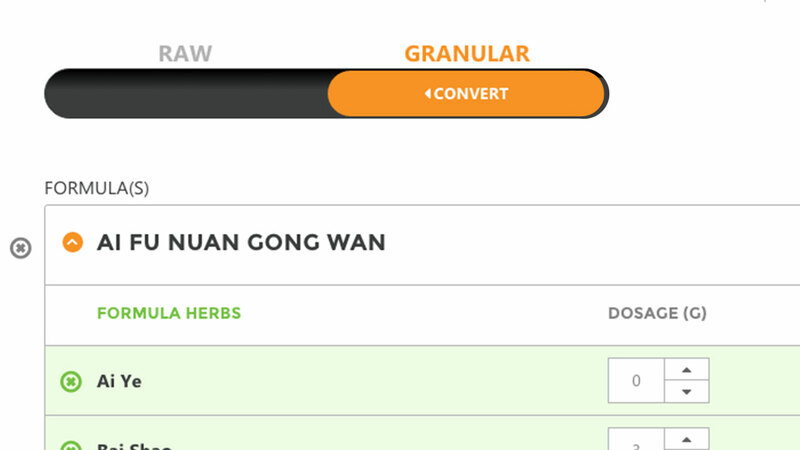 Convert your dosages from Raw to Granular and vice versa with just one click. Once in granular format, our software will also instantaneously change the dosage of single granular herbs while holding the integrity of the original ratios. if you choose to add herbs, remove herbs or change the dosages of the existing ingredients, our program will do the math and change the other dosages accordingly. Once you have added all the diseases, formulas, herbs and modifications to the prescription sheet you can now step back, look at the whole formula and start customizing. On the prescription sheet, you can add herbs, remove herbs, change dosages and visually watch your formula transform to meet the needs of your patients. © 2012-2015 MyHerbPharm ALL RIGHTS RESERVED.